Les Paul Standard, LP-Shaped Guitar from Epiphone in the Les Paul series.
" Not bad at all"
I love my Epiphone Les Paul Standard Quilted Top, its looks will shred you before the sound will!I got the Epi because it would fit in my small budget and still give me that phat, deep sound i wanted. Bought it at Mars Music for $400. I absolutely love my epi. No guitar is perfect, but this one isn't that far behind. The finish I chose was a dark red quilt, almost blood red in colour. The body is solidas a brick (a good 10+pounder) and the sound is very good for "Gibson-Designed" humbuckers. The fact that it is a Limited Edition also urged me to get this guitar. Above I did mention the pickups were good, but i think that i can do better with some custom pickups I'll get in the near future. Im considering a set of open coil PRS specials or maybe some Emg's. Aside from tune ups, every small probelm I have had has been under warrantee. When I first purchase the guitar I had a bad pot for the 3 way switch, so i had it replaced with a Gibson one from Mars; no charge. Along with the new pot the guy at Mars also fixed the setup, lowered the action by a hair, and waxed the guitar. More recently, (i have had it for about 6 months) I had a spur on the bridge fixed; it was also free at Mars. From my experience there, I'd recommend Mars to any musician for their excellent service and quality. I think the above statement said alot about this, but anyway the overall quality was good. You get what you pay for, so I am not surprised by a few glitches. As far as construction goes, the quilted top looks very deep and not at all like a spary on paint. The body and neck have a cream binding that looks great againt the dark red finish. All the hardware is black from tuners to stopbar and the pickups are open coiled. The neck it strait as you could ask for and the trapezoid inlays are perfect. A True Rock Guitar!!! The rating for this quitar is not really fair the way i see it. For what you pay, you get the an extreme quality axe. But when problems come, don't be surprised. I know if i didn't have a place like Mars to get it fixed, the review would not be as good. 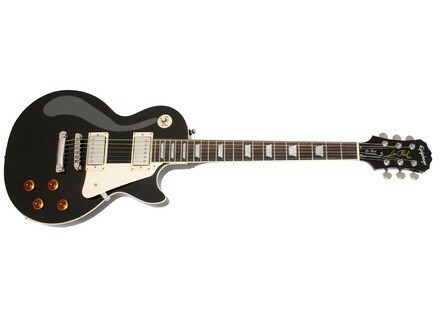 All in all, if i had the money, i would be reviewing a Gibson right now, but Epiphone is far from sub standard. If this guitar is in you're price range check it out!